Member of the Caryophyllaceae (pinks) family. Common relatives include carnation, baby’s breath, silene, chickweed and snow-in-summer. Flowers are about 1 inch wide with fringed petals and often a contrasting “eye”, in flat-topped clusters at stem ends. Stems are leafy, 18-28 inches long. Plant is classed as a dicotyledon, leaves not parallel veined. Plant is a herbaceous biennial (lives 2 years) but often forced as an annual. Flower fragrance is none to slight for most cultivars. Can be stored at 34-36F for 7-10 days. Data suggests that both dry and wet storage can be equally effective. Dianthus is from the Greek “dios” (divine) and “anthos” (flower). The specific epithet name barbatus means “bearded” and refers to the beard-like growth in the flower center. 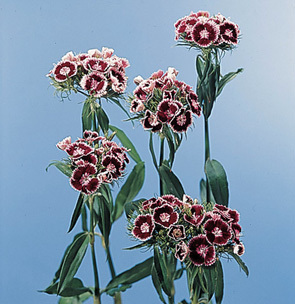 According to some references, the common name Sweet William derives from the French word “oeillet” or “eye” (referring to the contrasting color of the flower center) and became “Willy” and then “William” in English. Other references claim the name sweet William is in honor of Saint William or of William Shakespeare. Single and double flower forms exist, the flowers often have a contrasting “eye” (the center is colored differently from the outer parts of the petals).